PEVELY, Mo. 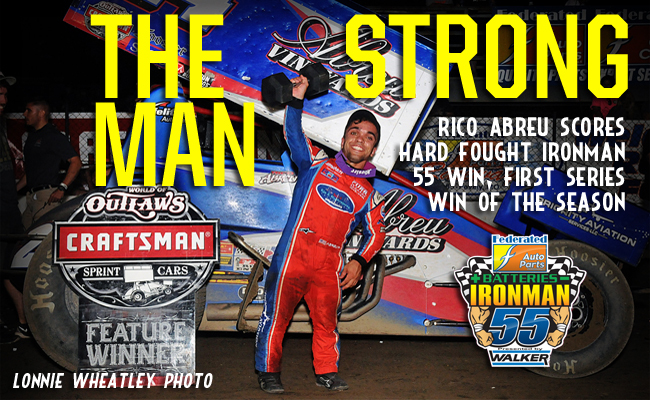 - Aug. 6, 2016 - Rico Abreu proved to be the strongest man Saturday night at Federated Auto Parts Raceway at I-55 as he powered forward and battled to the lead scoring his first World of Outlaws Craftsman Sprint Car Series victory of the season and the Federated Auto Parts Ironman 55 presented by Walker. Abreu, who started in third slipped back early but battled back into the top three after a lap 26 restart. He worked his way around the No. 9 of Daryn Pittman then set his sights on the No. 49 of Brad Sweet. Sweet bobbled coming off of turn four and Abreu raced past him onto the front straight. Through traffic, the then leader Kerry Madsen lost ground to Abreu and Sweet. On lap 38 Abreu threw a slider on Madsen through turns three and four, but Madsen held. What commenced though was a two-lap, three-way battle for the lead. Abreu eventually got around and through restarts and traffic and a brush with the wall on the final lap, Abreu cruised to the Ironman 55 win. Abreu is the 16th different winner of the season and the sixth different driver to score the Ironman 55 title. Since 2009, Craig Dollansky is the only driver to repeat. Sweet kicked off the night with his second straight quick time award in qualifying. His 11th quick time made him the season's leading qualifier, surpassing Joey Saldana who held the distinction through much of the year. Madsen, the 2014 Ironman 55 winner, started on the feature pole with with last year's Ironman winner, Shane Stewart on his outside. When the green flag fell, Sweet, who started fourth, battled forward, taking over third on the initial start and then racing Stewart, side-by-side on lap 10 for second. Two laps later, as Madsen worked his way through traffic, Sweet closed the gap on the leader and began challenging him for the lead. A caution flew and on the restart, Madsen pulled the away, this time maintaining his top spot through the traffic. When the next caution flag fell on lap 26, Madsen had lapped up to 16th position. Abreu, who had been sitting in fourth through much of the feature, got his chance on the restart, as he took over third from Pittman and then took advantage of Sweet's mistake on the exit of four to take over second. On lap 39, again slowed by traffic, Abreu caught Madsen and slid him through turns three and four. It was not enough that lap, but setup a three-way battle for position with Sweet mixing it up, side-by-side across the line on lap 40. Mixing it up across the track, Abreu was masterful maneuvering across the track. He took over the lead and in spite of the strong challenge from Madsen and near disaster at the end, crossed the finish line in first. To chants of, "Rico, Rico, Rico," Abreu hoisted the coveted dumbbell trophy and claimed the $20,000 prize. Abreu ended the two-year run of Kings Royal winners also taking the Ironman victory. Madsen, who looked to become just the second repeat winner of the Ironman 55, led the first 40 laps of the grueling 55-lap feature. In the end though, Abreu had the edge. Stewart battled past Sweet through the closing laps and took home the final spot on the night's podium. Joey Saldana was the KSE Racing Hard Charger, advancing nine positions to finish fifth. The World of Outlaws Craftsman Sprint Car Series rolls into the biggest week of the season as the series takes on the 5-Hour ENERGY Knoxville Nationals presented by Casey's General Store at Knoxville Raceway, Wednesday, Aug. 10 to Saturday, Aug. 13. To learn more about the Knoxville Nationals, visit WoOSprint.com/Knoxville-Nationals. Follow the World of Outlaws Craftsman Sprint Car Series on Twitter at Twitter.com/WorldofOutlaws, like it on Facebook at Facebook.com/WorldofOutlaws, or check out the latest videos on YouTube at YouTube.com/WorldofOutlaws. RACE NOTES: Brad Sweet picked up his 11th quick time of the season after taking the qualifying quick time at Federated Auto Parts Raceway at I-55. He is now the season's leading qualifier… Rico Abreu is the 16th different series winner of 2016 and the sixth different winner of the Ironman 55 since the inaugural event in 2009. Craig Dollansky remains the only repeat winner of the event… Joey Saldana was the night's KSE Racing Hard Charger, advancing nine positions to finish in fifth. CONTINGENCY WINNERS - MSD Ignitions ($25 cash): Brent Marks; MSD Ignitions ($50 cash): Kerry Madsen; Penske Shocks ($50 cash): Paul McMahan; JE Pistons ($50 cash): Joey Saldana; VP Racing Fuels ($50 cash): David Gravel; Edelbrock ($50 cash): Donny Schatz; Comp Cams ($50 cash): David Gravel; Morton Buildings ($50 cash): James McFadden; Cometic Gasket ($50 cash): Logan Schuchart; Super Flow ($50 cash): Jacob Allen; Craftsman/Sears ($100 cash): Rico Abreu; KSE Racing Products ($100 product certificate): Joey Saldana; Comp Cams ($50 product certificate): Kerry Madsen; JE Pistons (Set of Rings): Greg Wilson; JE Pistons (Set of Rings): Brent Marks. SEASON WINNERS: Donny Schatz - 16 (Volusia Speedway Park on Feb. 14, The Dirt Track at Las Vegas on March 4, Stockton Dirt Track on March 18, Stockton Dirt Track on March 19, Silver Dollar Speedway on April 2, Lincoln Speedway on May 19, Weedsport Speedway on May 22, Lincoln Park Speedway on June 8, Knoxville Raceway on June 11, River Cities Speedway on June 17, Rockford Speedway on June 29, Badlands Motor Speedway on July 3, Cedar Lake Speedway on July 9, Attica Raceway Park on July 12, Eldora Speedway on July 16, Ohsweken Speedway on July 26); David Gravel - 7 (Thunderbowl Raceway on March 12, Tri-State Speedway on May 14, I-96 Speedway on June 6, Eldora Speedway on July 14, Lernerville Speedway on July 19, Wilmot Raceway on July 30, Federated Auto Parts Raceway at I-55 on Aug. 5); Daryn Pittman - 7 (Royal Purple Raceway on Feb. 27, Perris Auto Speedway on April 16, USA Raceway on April 18, New Egypt Speedway on May 24, Jackson Motorplex on June 24, Eldora Speedway on July 15, Williams Grove Speedway on July 22); Brad Sweet - 7 (Volusia Speedway Park on Feb. 13, Volusia Speedway Park on Feb. 14, Cotton Bowl Speedway on Feb. 26, Ocean Speedway on April 1, Bakersfield Speedway on April 15, Plymouth Speedway on May 13, Badlands Motor Speedway on July 2); Shane Stewart - 5 (Arizona Speedway on March 6, Devil's Bowl Speedway on April 23, Lawrenceburg Speedway on May 30, Granite City Speedway on June 15, Brown County Speedway on June 19); Joey Saldana - 4 (The Dirt Track at Las Vegas on March 3, Devil's Bowl Speedway on April 22, Jacksonville Speedway on May 4, I-80 Speedway on June 22); Lance Dewease - 2 (Williams Grove Speedway on May 20, Williams Grove Speedway on July 23); Kerry Madsen - 2 (Eldora Speedway on May 6 and 7);Rico Abreu - 1 (Federated Auto Parts Raceway at I-55 on Aug. 6); Bill Balog - 1 (Beaver Dam Raceway on June 25); Chad Kemenah - 1 (Fremont Speedway on June 3); Jason Johnson - 1 (Placerville Speedway on March 24);Terry McCarl - 1 (Knoxville Raceway on June 10); Logan Schuchart - 1 (Cedar Lake Speedway on July 9); Jason Sides - 1 (I-30 Speedway on April 26); Greg Wilson - 1 (The Dirt Track at Charlotte on May 27).